The sky was drizzly and heavy grey on the Thursday before Memorial Day, also known as Flags In at Arlington National Cemetery. On that day, the Soldiers from the 3d U.S. Infantry Regiment (The Old Guard) execute a very simple but incredibly moving mission: To place a small flag with precision in front of every headstone in Arlington in just under 4 hours. It takes about a 1,000 Soldiers to cover over 228,000 graves. I went back to document a particular headstone receiving it’s first flag after having photographed the funeral of Retired Army Lieutenant Colonel Francis X. Duffy. 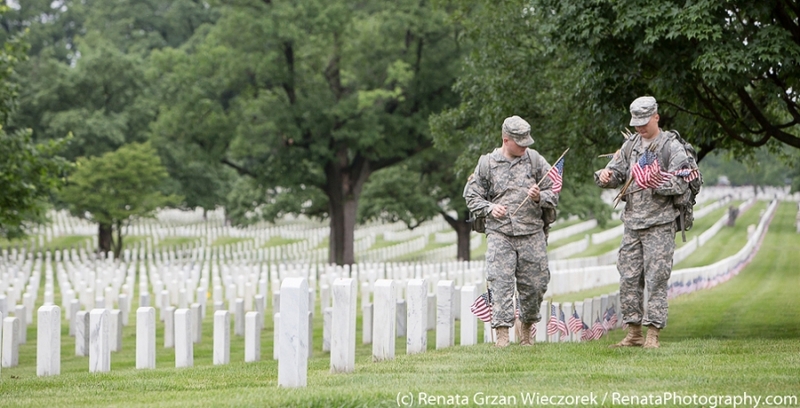 Each flag is placed exactly one foot, or one boot’s length, in front of every headstone. I also made a visit to another headstone, a friend of my husband’s who was buried two years ago, Scot Sturzebecker. The ache of these families losses is incomprehensible to me. I can only humbly be thankful and try to live a life worthy of their sacrifices. I concluded my visit in Section 60, an area of Arlington that has graves of some of the most recent wars like Iraq and Afghanistan. When Soldiers working this section were finished with their mission, they passed through one more time, pausing at certain headstones and telling stories or just taking a moment to remember. If you can’t visit a military cemetery today, take a few extra moments with these images to gratefully remember those that have served in our military, with so many giving their lives that we may live in freedom. May we endeavor to preserve what they have sacrificed for us. Please feel free to share any memories, tributes, or names of those service members you would like to honor as well. If you’ve never experienced a funeral service at Arlington, at the link below I have images with explanations of the iconic elements and traditions used to lay to rest our service men and women.